There’s nothing we like more than hearing from our customers about their adventures with Malletball and Toequet, We share some excerpts from those love letters below, along with some press references. We enjoy the enthusiastic reviews we’re getting in the press, and we listen carefully to suggestions from customers. Some of them have been incorporated in our products. We have virtually no advertising budget and recognize that our greatest strength is customer satisfaction and the genuine love people have for our wicket games. Enjoy them! Write to us about it! At the close of our employee Olympics, I repeatedly heard how much fun X-treme Malletball and Toequet were, and I had the honor of presenting teams and individuals with medals. Microphone in hand, I got to give everyone a hard time about making up their own Malletball rules as they played. My co-workers chuckled in agreement. I know that Malletball will become a Dublin favorite not only at the Olympics but as a regular activity at the rec center. Stay in touch! We are finishing a 2100 mile auto trek through Michigan and Ontario and will soon be headed back to our St. Louis home. We’ve had a great trip and we introduced Toequet and MalletBall to Canadians as we passed through. The people who tried it thought it was wonderful - including an entire soccer team we met in a café. (What a conversation piece this game is!) Most of the children used their toes to kick the soccer balls, and the adults used the mallets. It soon was obvious to the youngsters that the mallets were getting more points, so they started to use the mallets, too, for the close-in shots at the wickets, but continued to boot the long ones. Anyway, it was a very positive experience each time we hauled the set out of the trunk and set up the course. Right now it is set up on our daughter and son-in-law’s vast lawn here in Oakville, and we are expecting some friends to play. I’m going to have to buy them their own set for Christmas. Thanks for a great idea and a great deal of fun! I was delighted to find out that my Wonder Wicket Lights strap onto your big wickets almost as easily as they fit the conventional wickets. Malletball brings an entirely new feel to the game, as it changes the ball-mallet relationship considerably with a new set of challenges and hit-dynamics. When I told my 12-year-old grandson about Toequet he got very excited. He's a soccer guy and a major croquet nut. This season we have introduced Toequet and Malletball as a weekly feature of our social calendar, every Wednesday from 1:00 PM to 3:00 PM. Some people say it looks pretty silly, but then they try it and like it, and we have more people coming each week. I’ve got to buy some more equipment, and I’m definitely playing this game at our summer place in Maine! "Cool Gear: Croquet goes down the rabbit hole"
This cool story and pic at the top of the Recreation section of Boulder, Colorado's daily captures the fun and spirit of these giant wicket games. Picture and seven column inches in the HOME section. Front page color picture and 9-inch story by sports writer Michael Strauss. Four-column color picture and caption at top of front page of Celebrations section of Sunday paper. An enthusiastic review of the new equipment and rules leads off the Briefcases column on the front page of the BizTech section. We all outgrow things. Sometimes the sense of loss that goes with that process leads to an invention. You could say Denny Ridgway's family outgrew recreational croquet. For years the sport of mallets, wickets and hard grooved balls had served as the centerpiece for Ridgway family gatherings in Terra Haute, Ind. But alas, many of them had gotten too good at it to remain satisfied with playing on scraggly lawns. The balls would bounce off roots and roll down the slightest of hills. They'd get stuck in tall grasses. The Ridgways didn't have the money to install a proper croquet lawn. It was time for something more extreme. The family brainstormed and came up with a whole new sport. One that could be played on any vast expanse, no matter how rough the terrain. It involved color-coded soccer balls and giant wickets made of PVC pipe. It was croquet for Alice in Wonderland. They called their invention "Toequet," and decided it was fun. Fun enough to market for the masses through the Internet. 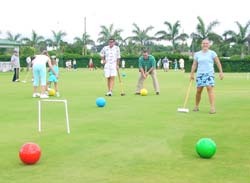 Then along came Bob Alman, director of marketing and development at the National Croquet Center in West Palm Beach, Fla. Alman read about toequet and asked the Ridgways to send him a set. He set up the plastic wickets and soccer balls at the center, and thought it seemed like a nice enough spin-off of croquet. It wasn't until a friend of Alman's started whacking the soccer balls with an "official" 2.5-pound mallet (more than two times the size of a "recreational" mallet you might buy in a set from a department store) that Alman realized the equipment's true potential. After a spirited round of toequet using these big mallets, "malletball" was born. "There really is nothing like it," Alman says. "It's like golf, except you don't tee off." Now Alman is doing everything he can to make sure Malletball takes off. Today, southern Florida. Tomorrow, the world. He's visiting schools. He's playing the game with anyone who will come out and swing a mallet. And he's doing it all in costume — wearing all white, complete with a big safari hat and a "Mr. Wicket" name tag. "It's theater, partly," he says. Priscilla Speichler, an event manager for Great Expectations, the nation's largest singles club, recently arranged an evening of malletball for her members. She promoted it as "croquet on steroids"
"Everyone who played was smiling and laughing," she says. Alman hopes Malletball and Toequet prove to have recreational appeal. At $142 for the soccer balls and wickets, and $100 more for two big mallets that everyone can share, the start-up costs more than most recreational croquet sets. But then, who wants to play regular croquet? For more information, visit www.malletball.com or www.toequet.com. Contact Camera Staff Writer Chris Barge at (303) 473-1389 or bargec@dailycamera.com.